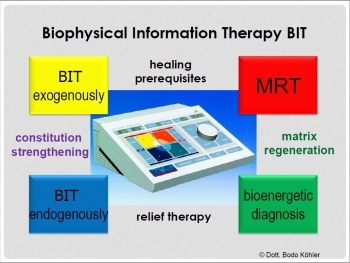 The "Biophysical Information Therapy" (thereafter BIT) concept is a recent creation and is based on the idea that all vital functions of an organism are of a biophysical nature and managed by a continuous information flow. Behind this is the notion that matter forms just a (small) aspect of reality (because of a constant natural element it is in reality just one billionth part). Therefore the energy aspect must absolutely be included to complete the description; according to C. Rubbia, (1984 Nobel Prize), energy is superior to matter and determines its structure. Since light can be considered a wave as well as a corpuscle (quantum), reality can be seen as material (measurements, weight, etc.) as well as energy (like a model of holographic interference waves). Even on an atomic level a field (electrical) belongs to each charged elementary particle. During chemical reactions these fields react to each other first, but not the particles. The formation or dissolving of material structures is also a pure biophysical process and is therefore called field coupling. The energy shifts needed are caused by the absorption (or release) of photons, or energy quanta. These are also the ones which trigger chemical processes. 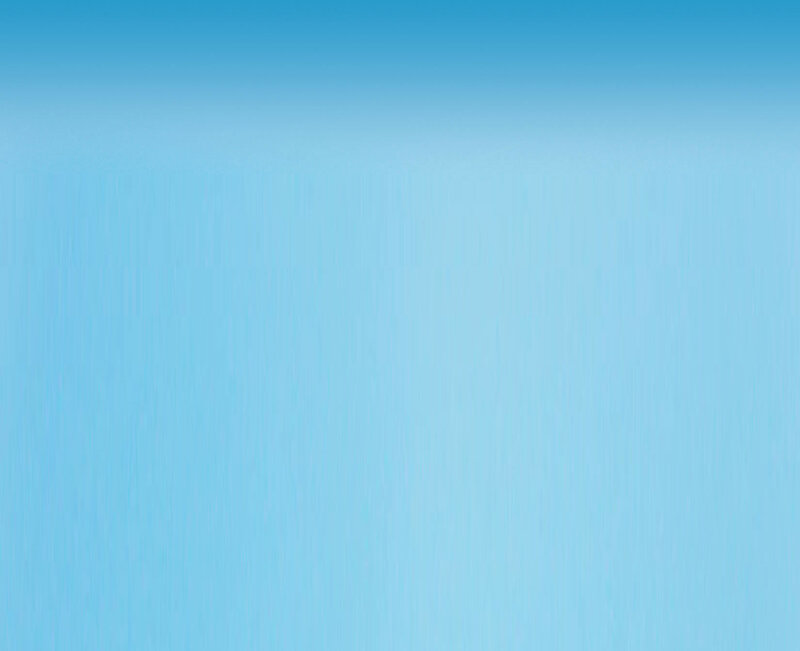 They also provide the necessary high speed (The impulse rate is 109 Hz). Each material structure, the human body as well, can be considered a complex oscillation system formed by the interference with the countless individual frequencies of the atoms and molecules and which is absolutely unique to the type and composition of the corresponding structure. It should be mentioned that these complex fields themselves even in the case of inert matter (e.g. metals) can indicate an extremely high degree of order which can be demonstrated in the corresponding structure through electro-microscopic absorptions. Living organisms vary this order as needed. In case of an acute inflammation, we are talking about deterministic chaos (because it is an oriented healing), and in case of healthy tissue, about dynamic order. The degree of order determines at the same time the capacity to adapt to environmental factors, the capacity to quickly regulate the metabolism being a decisive factor. However, at this point something must be clearly stated. The field comes first and not the matter! Matter is to be considered as function of the field. It is absorbed over and over again (in energy, like photons) and renews itself always in the same manner based on a stable field. For this reason the fields are creating enrolling or rather unrolling vortexes. Mass represents the state of a maximal enrolled (bowl) vortex. This is the background of the “blunt relation theory”, according to Heisen-berg, after that can be determined either the location or the time of appearance of an electron, nether both together. Scientists of quantum physics call it “smear effect” of a field. The interchanging energy quanta (W and Z bosons) are superior to the matter (cf. C. Rubbia). The oscillation field is typical for each material structure, very unique and therefore non-interchangeable. One of the famous scientists in the 19th century was Nicolas Tesla. He discovered many secrets of energetic interactions and did experiments with new energy forms. To this day only a small part of the results of his research is known. Some of his developments still are not understood by the scientists. In the twenties of the last century, possibly inspired by Einstein's new findings, the scientists had the idea to further investigate the energy aspect of persons. In addition to names such as Abrams, Rife and W. Reich, who must be mentioned here, the work of Lakhovsky and of the Russian A. Gurwitsch, who discovered around 1930 that certain characteristics of living organisms can transfer electro-magnetically are the most widely known. In those days he experimented with bacterial cultures; their virulent characteristics could be transmitted through quartz glass, but glass being used however to form a shield. These first successful experiments were incentives for more intensive research and also laid the base for the work of F.A. Popp on biophotons which followed. Kirlian photography also indirectly shows that organisms radiate fields which lead to changes in certain functional states, if they are themselves the object of a modification. This can be caused by outside influences or be the result of therapy. Understanding these phenomena however, only came with the calculations of the German physicist B. Heim, together and of the Austrian W. Dröscher (Further General Quantum Fields Theory), as well as the experimental work by the Swiss physicist J. Muheim (†1997). 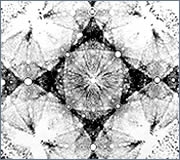 Biophysicist W. Ludwig's contribution has been to put this very work which is very difficult to understand for the uninitiated into scientific popularization (among others, through several publications and his book "SIT - System Information Therapy", Spitta Publishing Company 1994); complemented by his own research (spectroscopic measuring). Besides this, significant worldwide research exists which partially led to completely new ideas about living organisms, i.e. W.R. Adey, Del Giudice, C.W. Smith. It could be demonstrated that the controlling processes in an organism can only be energetic in nature because of their high velocity (approx. 1018 chemical reactions/second in an organism! ), that our body fluids are capable of storing information, that DNA in a state of agitation enters into the so-called exciplex state and works on the threshold of laser waves, that our nervous system presents a holographic pattern which forms through the interfering Maser beams (cf. "Neuronal Functioning Model"), that changes in tissue are only possible by reprogramming of the corresponding controlling energy fields, etc. The decisive statement is from Nobel prize winner Erwin Schroedinger. He said: “Living systems are coherent systems. Who understands nothing of coherent states cannot grasp living systems". The matter concept itself had to be revised basically. Matter subdivides itself into 3 aspects: Mass, energy, information. Potential fields ensure the structure. The apparent stability only is for the same as long as given, as the causing fields are not subject to any changes. The particles themselves are very short lived and really unstable. Matter has to be understood of bundles of energy only as a compression at the interfaces to Sheldrake. Until the basics of quantum physics had been defined, the stability of matter lead scientists to suppose for several centuries that our entire universe was undoubtedly ruled by mechanical laws (after I. Newton). It is unfortunate these linear mechanical laws were also applied to man, as time related functional processes were lost from sight. Only with Einstein did this dogma lose ground. Unfortunately physics and medicine continue to hold on to outdated ideas. Independent from the scientific spirit which prevailed at the time, doctors and other healers have collected empirical knowledge throughout the entire world history, which allowed them to perform electro-magnetically oscillation treatments. This manifested itself before all through the ancient magnet and precious stone therapy where magnets and certain crystals applied to sick parts of the body made it possible to eliminate pain and induce healing. Moreover, colours were also used at an early stage, in the form of colourful fabrics or coloured powders, later also in the from of colour radiation on specific areas of the body. Sounds were also considered to be important in medicine and were already mentioned in the bible.